A DC landmark, the site of family celebrations, cozy Americana. 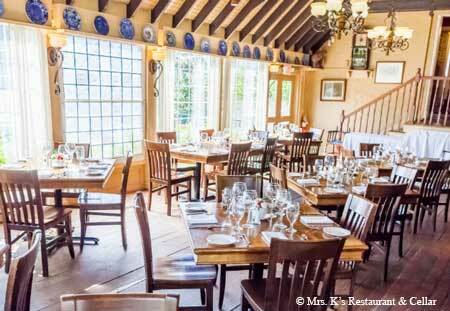 : While many other restaurants in the DC area go trendy, Mrs. K's keeps its place on the city’s dining roster by dint of its picturesque setting and its all-American cuisine. A wine cellar is stored in specially built caves, and an elegant wine bar is located downstairs. The regular lunch and dinner menus feature contemporary and traditional dishes, some with just a hint of Caribbean influences. But perhaps the highlight is the two-course Saturday brunch and the Sunday buffet, a spread of just about every imaginable breakfast and brunch item, with a carving station, an omelet station, Belgian waffles and fresh oysters, to name just a few of the offerings. The buffet lineup changes weekly. Dinner brings appetizers like grilled tiger shrimp while entrées may include herb-crusted Atlantic salmon, pork loin and Cornish hen. Patrons will find a children's menu and a happy hour menu as well.